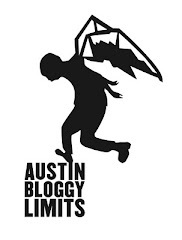 Let's face it, there are a lot of good events happening in Austin tomorrow night. There's the sold out Phoenix show with Two Door Cinema Club at Stubb's, there's also a mini-punk festival going on at Plush of all places. In fact, my homeboy over at 'Nites Blog has word that ...and You Will Know Us By the Trail of Dead will be headlining at Plush tomorrow. The upshot of both of the shows I've just mentioned is they are sold-out and/or will become sold-out within minutes, in the case of the Plush show. 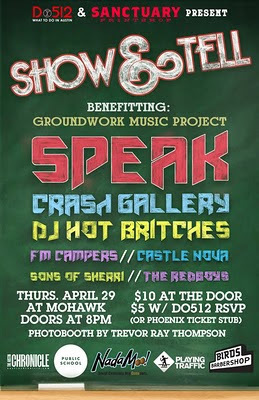 So, realistically, you should plan to head over to the fortress of rock on Red River, the Mohawk to see Speak. All the truly important information you need is on this handy flyer. Pay close attention to the part where you can pay half price simply by RSVP'ing at Do512. Although if you were a particularly altruistic person you wouldn't WANT to pay half price, since the proceeds for this show benefit Groundwork Music Project. I know how it is though, if you need to get the half-off I won't judge you and neither will the door man at the 'Hawk. Oh, hey look, if you're one of those lucky people who got tickets to see Phoenix your ticket stub will ALSO get you half-off at the door tomorrow. Gotta respect that. I don't know much about Crash Gallery but word on the street is the lead singer is very energetic and odds are he will end up in the crowd at one or several points in their set. If we're not there to catch him when he stage-dives he might get hurt, and I don't want to have that on my conscience. Do you?